And now there are ten…. I am up to ten rows of my Dear Jane completed. 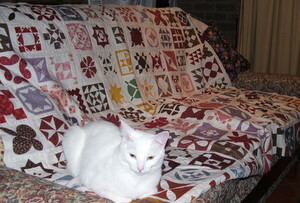 The pictured Puss is my dear patchwork buddy ‘Iggy’ who likes to be where I am sewing, cutting, piecing, in my face, she is just delightful.